30 Day Trial. Documents can not be saved, exported or printed. There's only a single MIDI port and a somewhat limited choice of patterns. 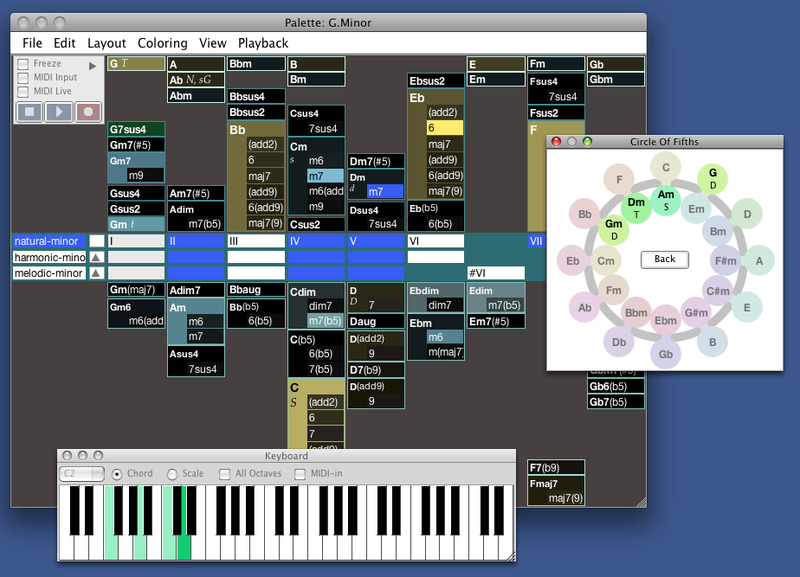 Harmony Navigator is an intelligent brainstorming and composition tool for songwriters and musicians of all styles. Its intuitive user interface puts the theory of harmony at your fingertips. Browsing chord palettes in the circle of fifths is instructive and fun. Every click is accompanied "live" by simulated musicians, making it easy to explore chord changes and improvisation scales suiting your song ideas. Be guided by chord and scale patterns for keyboard, guitar and bass updated in real-time. The intelligent simulator creates excellent accompaniments, even if you're not yet good at playing an instrument yourself. Unleashes your imagination and grows with your skills. Everyting is customizable -- you could even roll your own system of harmony. Dropped defunct coloring scheme "Tracking"